A solar roof, parking assist, lane keep assist, dynamic radar cruise control and remote air conditioning, is what I call a smart car. It’s also what I call the 2010 Toyota Prius Hybrid. The solar roof keeps the temperature at a comfortable level in the cabin. The parking assist feature literally parks the car by itself, while lane keep assist keeps the vehicle in its lane if it senses it is veering off. The dynamic radar cruise control makes sure you’re not following too closely to the car head of you. It is fascinating when a car company puts its heart and soul into the design of a vehicle. It is no fluke that Toyota’s Prius is so smart and sophisticated, and no detail has been left behind. The solar panel, the remote activated air conditioning system, the synergy drive and the aerodynamic design of the vehicle itself, all leave you wanting for very little. Since its introduction to the United States in 2001, the Toyota Prius has come a long way. It all started with an idea and ended with a product that over the years has grown in consumer appeal. 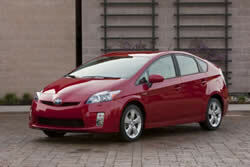 When the Prius first rolled off the assembly line, its focus was to offer better fuel economy. The vehicle offered two engines, one electric and the other gas. Both engines would communicate with each other to propel the vehicle forward. Although, these engines did not come equipped with much horsepower, it did offer unheard-of fuel economy ratings with upwards of 50+ miles per gallon. 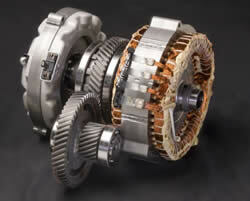 Toyota called this technology hybrid synergy drive. Keep in mind that hybrids were not offered much in the mainstream in the early 2000s, but have gained in popularity as the price of gas skyrocketed. The first generation Prius was relatively small in size, but had excellent fuel economy. When the Prius was redesigned in 2004, it took on a more appealing look; it was definitely bigger than the first-generation Prius. However, as we fast forward to today, the third generation Prius is better than ever with more horsepower and more technology working in harmony to keep the vehicle working effectively and efficiently. With this new Prius, there are choices. The different packages include the Prius II, III, IV and V. The higher the package, the more features and the more expensive the vehicle. Let’s talk about the drive. The new Prius definitely has better acceleration than the previous generation vehicle. It features a more powerful engine that now boasts 134 horsepower. Acceleration was also improved, with or without the power mode – a feature that allows more power to be used when needed – if engaged. It accelerated from 0 to 60 in just under 10 seconds. That time is pretty impressive given the fact that the Prius has a 1.8 L DOHC VVTi 4 cylinder engine. In normal driving, it ran well, and merged on the expressway with little problems. The Prius test car handled very well when cornering during high and low speeds. Body roll was present when pushed to its handling limits, but it was very slight. When the brakes are applied, the power from braking is converted into electric energy, which then charges the battery. At idle, the gas motor is disengaged to reduce emissions and preserve fuel economy. One interesting thing is that even when the gas motor is off, the air conditioning will still operate. Speaking of air conditioning, I found the climate controls buttons easy to use, with its functions clearly displayed. However, the smallness of the display screen made it difficult to read the symbols. If excessive sunshine were present, it might pose a problem. I think the display screen should have been made wider for better viewing. Among the few things the Prius is lacking is a dual climate control function that would allow the front driver and passenger to adjust their settings individually for comfort. I also found the instrumentation display panel chocked almost too full of information. The driver will have to refer to the manual just to understand the symbols. In addition, I was hoping that the new Prius would come equipped with a tachometer, but, I guess was not Toyota’s main focus for its latest generation vehicle. One feature that has changed on the new Prius is the location of the shifter. Instead of being located on the steering column, it is now down on the console within easy reach of the driver. When you put the car in reverse by moving the shifter to the left and up, a beeping noise is heard. To put it in drive, the shifter is moved to the left and down. To park, just press the “P” button located near the shifter. I enjoyed playing around with the different driving modes. The modes include power mode, EV mode, and eco mode. I enjoyed power mode the most because the acceleration was noticeably better when engaged. Eco mode is specifically for maximizing fuel economy. When in EV mode, the car drives solely on battery power for up to ½ mile under certain conditions. All of these modes are within easy reach of the driver. With that, expect nearly 50 miles per gallon highway in the new Prius. One thing that has been enhanced is the interior. From the vents to the navigation system, everything is in sync. I would describe the redesign as appealing because of the fine lines that are demonstrated on the dashboard and console. An interesting feature to note is the power windows with auto up/auto down. It used to be only the driver who could control those settings. Now all passengers can enjoy this feature. I test drove the Prius IV, which came with leather seats, leather wrapped steering wheel, volume controls for the radio on the steering wheel, and also a JBL audio system with 8-speakers and a 6-disc CD changer. A navigation system is optional, as is the satellite radio. The technology on this car is amazing. You can control most everything from the steering wheel. The instrumentation panel is also unique. It monitors several functions on the vehicle, which include miles per gallon, vehicle speed, past trip fuel consumption, battery charge level, energy flow from the gasoline and electric systems and more. Bluetooth technology is also available. The seats were comfortable with plenty of support for all passengers. The rear leg and headroom are also decent. The exterior of the Prius is very impressive. The aerodynamic design reduces drag and improves fuel economy. Wheels come in a choice of the standard 15-inch, or the optional 17-inch alloy wheels that add extras appeal to the Prius. The rear deck spoiler and the projector beam halogen headlights, with auto off feature, is also a plus. Heated mirrors prevent fog or other weather related problems from occurring. In the safety department, the Prius offers cutting edge technology, complete with 7 airbags, 4-wheel disc anti lock brakes, brake assist, Electronic Brake-force Distribution (EBD), and enhanced vehicle stability control with traction control for added safety. The enhanced vehicle stability control helps prevent the vehicle from sliding sideways while cornering, by adjusting engine power, braking and steering to assist the driver giving him or her more control of the vehicle. The trunk area has reasonable storing.